ASU professor's artwork debuts in new biology building at Utah State campus. When a new building dedicated to teaching life sciences opens in January at Utah State University, it will feature a soaring, vibrantly colored artwork by an Arizona State University professor who used the principles of biology to create it. Mark Pomilio, an associate professor in the School of Art in the Herberger Institute for Design and the Arts, spent the past year working on “Symbols and Symmetries,” which was recently installed in the third-floor atrium of the building. “There was a specific context for the piece from the get-go — the type of research, like biology and genetics, that is going to be happening in this space,” he said. Pomilio started the three-dimensional work by thinking about scientific imagery and began playing around with a hexagon. The six-sided shape shows up everywhere in nature, from honeycombs to the molecular skeletons. The artwork "Symbols and Symmetries" by Mark Pomilio was recently installed in the new Life Sciences Building at Utah State University. As he worked, the shapes built on each other. Technically, the work was a challenge. Initially meant to be two smaller pieces, the project was altered halfway through to become one large work. Pomilio had to rent studio space because his own studio wasn’t large enough to accommodate the 8-by-20-foot piece. Last month, Pomilio put the disassembled work into a truck and drove 12 hours to the Utah State campus in Logan, Utah, where he reassembled it and installed it in the 103,000-square-foot Life Sciences Building. The colors in “Symbols and Symmetries” reflect the shades of red in the mountains seen through the wall of windows. Creating large-scale art is nothing new for Pomilio, who taught a course in public art at the University of Michigan and created seven pieces on the campus there. “Public art can be a memorial, it can highlight a neighborhood, and it gives a place interest,” said Fahlman, who also is adjunct curator of American art at the Phoenix Art Museum and a former board member of Scottsdale Public Art. “Public art enlivens the environment. It’s fun to come upon a piece and be surprised,” she said. The work is near a wall of windows that showcases the nearby mountains in Logan, Utah. Fahlman spent years involved in the process of taking public art from proposal, through many conversations and approvals with stakeholders to the final unveiling. It can be a fraught undertaking as everyone weighs in and all the factors are considered, she said. “Public art has to be ADA compliant, you need to make sure it’s safe, you have to make sure someone won’t climb on it. Is it going to offend anyone?” she said. Pomilio went through an extensive application process for the Utah project, including giving a presentation to a panel of architects, designers, deans and faculty. He won the bid over more than 300 applicants. “I think they understood that I would make a piece that was in line with what they wanted,” he said. “But I wouldn’t know exactly what it was going to be until I got deeper involved in the project. Younan connected with her culture through the Assyrian Student Association of Arizona while she pursued her English degree at the ASU’s West campus. She said the close-knit community of New College was perfect for cultivating her educational and professional interests. “I never lacked any opportunity,” she said. Younan’s pursuits proved to be well-rounded: She was involved with TRIO, the EARTH club, Canyon Voices Literary Magazine and the Arizona Legislative Internship Program, just to name a few. She also loved analyzing literature with her classmates. Before she starts at the Sandra Day O’Connor College of Law in the fall, she’s working on her writing portfolio, which includes scripts, fiction and more. After earning her law degree, Younan wants to honor her history as well as the skills and knowledge she has cultivated to give back. “I hope to acquire a job as a state prosecutor and serve my community well,” she said. She ultimately wants to do nongovernmental work to help Assyrians and other persecuted minorities. “Educated Assyrians can help those in their homeland, so that the entire people may move forward,” she said. 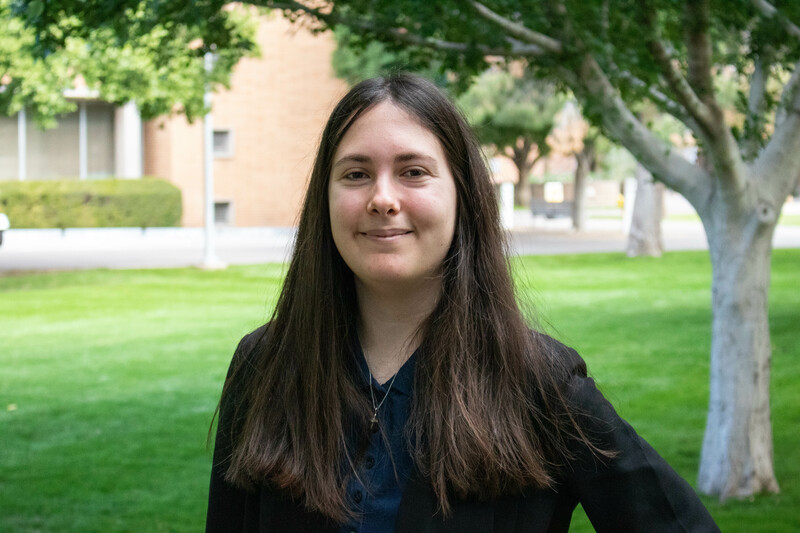 As she closes the chapter on the first part of her Sun Devil journey, Younan talked with ASU Now about how she’s reflecting on her field and her experience thus far. Answer: After completing my first year at ASU, I decided to focus more on self-improvement instead of only looking at a career end-goal. The English major was the best choice, because it would allow me to develop my writing, speaking and presentation skills all while hearing different perspectives as I’d analyze literature with other students. A: It’s important to look at tasks and goals from an interdisciplinary perspective. With my major in particular, I learned to make sure my writing would be rooted in reality and also to look at what I read from different perspectives in order to create various possible interpretations. A: ASU has numerous opportunities for undergraduate students to get involved, and the campus culture is exceedingly inclusive. A student is not just another number, they’re a part of a family. The professors also care about their students and are enthusiastic about the subjects they teach, so ASU seemed like an ideal place to learn and develop my skill set. A: I’d say all the English professors at ASU’s New College taught me the same important lesson: to be enthusiastic about any text I read and to outline well so that I won’t be stressed when writing a final paper. This advice has served me well and helped me manage my time more wisely. A: Students should not compare themselves to others all the time and instead focus on improving themselves. There’s also no such thing as being completely productive, no matter how well a person plans their day. It’s not a bad thing for students to rest and give themselves a little credit for their hard work. In fact, it’s a must in order to avoid burning out. A: My favorite spot on campus would be a tie between Fletcher Library, which offers a great, quiet space to study, and the TRIO Student Support Services STEM office, where fun events are always around the corner. A: I’m graduating a semester early and was accepted to ASU’s Sandra Day O’Connor College of Law, so my intent is to secure temporary employment until school starts. I’d also like to update my writing portfolio. A: I would create a program centered around helping the displaced Assyrian population of the Nineveh Plains in northern Iraq. Assyrians are a Christian ethnic minority considered indigenous to Iraq. However, since the devastation caused by ISIS, thousands of Assyrians have been forced out of their homes and have fled the area in order to avoid religious persecution.